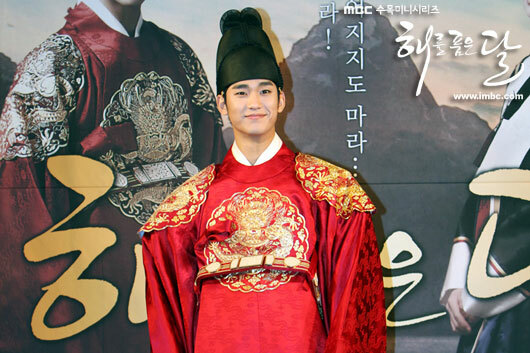 It’s reported the gonryongpo, the imperial robe costume wore by Kim Soo Hyun (playing the role of Lee Hwon) in MBC drama series The Moon that Embraces the Sun is costing 1.5 million South Korean wons (about $1,335 US dollars). On February 4th, director of MBC Arts Center, Bong Hyeon Sook revealed to media, “The gonryongpo of Kim Soo Hyun was created by hand. Embroidering it alone took one month.” In addition, the production cost is revealed to be 1.5 South Korean wons. On February 2nd, the sorrowful look of Kim Soo Hyun after receiving the letter left by Yeon Woo (Wol, Han Ga In) attracted attention. According to AGB Nielson, the ratings of The Moon that Embraces the Sun has hit 37.1% on national average basis, inching closer to break to barrier of 40%.